Tyrone made it two Division One Football League wins in a row with a comfortable nine-point victory over 14-man Cavan in Omagh. Peter Harte scored the only goal of the game 12 minutes after Killian Clarke was sent off for the visitors early in the second half. Mickey Harte's men had a strong breeze behind them in the first half and led by 0-8 to 0-4 at the break. The victory at Healy Park follows last week's win over Monaghan. Clarke was shown a red card three minutes into the second half for a foul on Kieran McGeary. Harte, who hit 1-6 in the victory over Monaghan, grabbed his goal with the score standing at 0-10 to 0-5, with the forward finishing well after receiving a superb through pass from Darren McCurry. The Breffni county now have just one win in five outings and face a massive task in trying to avoid an immediate return to NFL Division Two. The Red Hands got into their stride early on and Connor McAliskey, making his first start of the season, edged them in front with a free. Niall Sludden added a neat score and Cathal McShane's mark made it 0-3 to 0-1 by the 10th minute. They adopted a counter-attacking approach, defending in numbers and stretching the visitors with their pace and support play. Mattie Donnelly presented a constant threat, winning the free that McAliskey converted for a four-point advantage, and Cavan went almost 20 minutes without a score before Martin Reilly nailed a free. 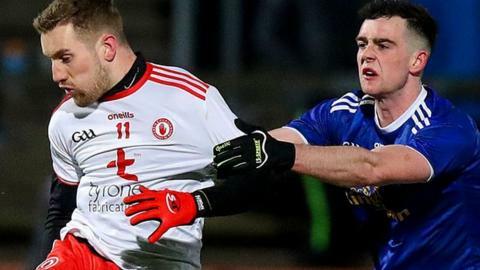 With Conor Moynagh and Christopher Conroy standing firm, Mickey Graham's men held out against a Tyrone side struggling to find the openings their approach play was threatening. However, Donnelly's surge created a score for Kieran McGeary, and points form Harte and Sludden gave them some breathing space at the break. Midfielder Clarke, one of Cavan's key figures, picked up a second booking less than two minutes into the second half, and they faced an uphill task with 14 men. McAliskey and Frank Burns tagged on points and it was the creativity and vision of substitute Darren McCurry that carved the opening for Harte to fire his shot to the bottom corner of Raymond Galligan's net for the only goal of the game. Another replacement, Kyle Coney, added a spectacular score and the Red Hands were soon 10 points clear, but could only claim four points in the final quarter as the visitors dropped men back. Corner back Hugh Pat McGeary exploited space to pick off a couple of scores and Harte added another to bring his tally to 1-3. Cavan substitute Cian Mackey pulled back three points, including one of the two they managed from play in the entire game, but the outcome was never in doubt. Tyrone: N Morgan; P Hampsey, R McNamee, HP McGeary (0-2); T McCann, F Burns (0-1), C Meyler, B McDonnell, R Donnelly; M Donnelly (0-1, f), N Sludden (0-2), K McGeary (0-1); C McAliskey (0-3, 3f), C McShane (0-1, m), P Harte (1-3, 0-3f). Subs: D McCurry for McAliskey (44), K Coney (0-1) for McShane (45), H Loughran for K McGeary (53), L Brennan for McNamee (58), R Brennan for Hampsey (60). Cavan: R Galligan (0-1, f); J McLoughlin, P Faulkner, C Moynagh; C Brady, C Conroy, C Rehill; P Graham, K Clarke; M Reilly (0-1), D McVeety (0-1), N Murray; N Clerkin, J Brady (0-2, 2f), C Madden. Subs: G Smith for Clerkin (h-t), T Galligan for Graham (h-t), N McKiernan (0-1, f) for Brady (48), C Mackey (0-3, 2f) for Conroy (53), S Murray for N Murray (66).